BUILT: 1938-39 by the Kansas City Bridge Company et al. A group led by John Mullen of Falls City, Nebraska, laid the groundwork for the Rulo Bridge in 1933, when it secured permission from Congress to build and operate a toll bridge over the Missouri River here. That year Mullen's group engaged Kansas City engineers Harrington and Cortelyou to prepare plans for the bridge. The War Department approved the bridge in May, but several months later Mullen approached the Richardson County Board with an offer to assign the county all rights to the bridge. The county accepted Mullen's offer, but only on the condition that it not have to pay for construction. Considering that the bridge was estimated to cost between $700,000 and $800,000, this was no small caveat. Mullen proposed that the county apply for a federal grant and loan, and it did, but the process dragged for almost five years. Finally, in September 1938 the Public Works Administration agreed to fund 45 percent of the bridge's construction. To cover the balance, the county issued bonds that would be repaid through bridge toll revenue. With funding secured, the board officially entered a contract with Harrington and Cortelyou, who had been operating under a verbal agreement. The engineers aligned the channel spans of the new bridge with the three 375-foot trusses of George Morison's 1889 railroad bridge immediately upriver. 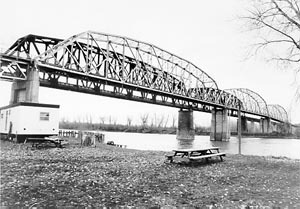 Unlike the pinned Whipple trusses of the railroad structure, they used rigid-connected Pennsylvania trusses for the highway bridge. The county opened bids on November 7, 1938. Of eleven proposals received, the board selected the joint venture of the Kansas City Bridge Company and the Missouri Valley Bridge and Iron Company, low bidders at just under $6,000,000. In an effort to provide local employment during the Depression, the county required the contractors to hire Richardson County residents whenever possible. Construction soon commenced and continued steadily through the bridge's completion in November 1939. Thirty years later the states of Nebraska and Missouri assumed joint ownership of the Rulo Bridge. Today it carries U.S. Highway 159, free of tolls.